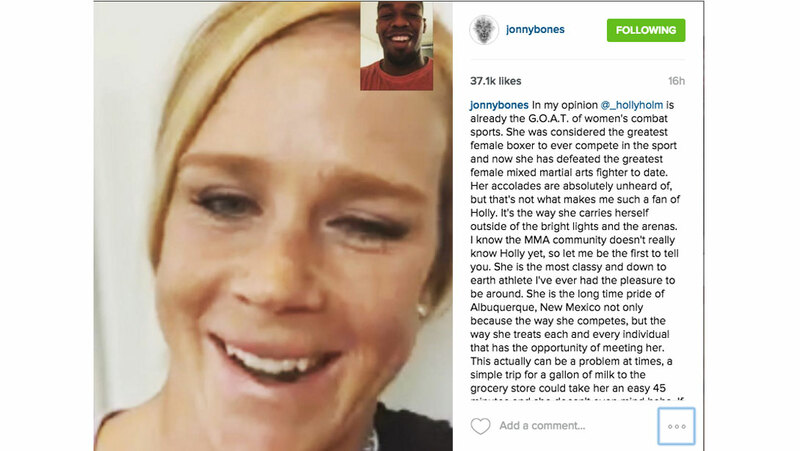 Jon Jones Calls UFC Champ Holly Holm the G.O.A.T. Former UFC Light Heavyweight Champion has nothing but good words about the new UFC bantamweight champion. Holly Holm created one of the biggest upsets in UFC history by beating Ronda Rousey at UFC 193. With the win came a slew of compliments, one specifically from Jon Jones. Jones is a friend and teammate of Holm at Team Jackson-Winkeljohn in Albuquerque, New Mexico. As for Rousey, the former champ took to Instagram to share a post-fight update, since it was speculated that she had a broken jaw and would be out for a year. The broken jaw is a rumor -- she'll be back.